The Navy has completed the specifications and has set the length for its next generation nuclear ballistic missile submarine, the head of the Navy’s submarine construction program told attendees at the Navy League’s Sea-Air-Space Exposition 2014 at National Harbor, Md. on Monday. 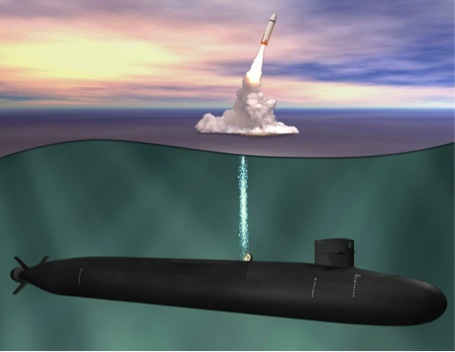 The Ohio-class Replacement Program boats (ORP, formerly known as SSBN(X)) of 560 feet about the same length as the Ohio-class (SSBN-726) but with eight fewer missile tubes than the service’s current boomers, said Rear Adm. David Johnson Program Executive Officer (PEO) Submarines for Naval Sea Systems Command (NAVSEA). The extra length — in relationship to the number of missile tubes — was included in the design to improve on stealth, cost and maintainability of new SSBNs. “We included the requisite stealth technologies to insure the ship’s survivability for its 42-year service life,” Johnson said. The more than 20,000 ton submarine will be the largest submarine the Navy has ever constructed — about half the size of the Soviet designed 45,000-ton Typhoon boomers and roughly the same tonnage as the Russian Navy’s new Borey-class (Project 955A) SSBNs. In cooperation with the U.K. Royal Navy Successor-class of SSBNS, ORP boats will field 16 missile tubes armed with Trident II D5 submarine launched ballistic missiles (SLBMs). The latest Navy figures estimate the boomers will cost $110 million a year to operate with a second through twelfth ship with an average cost of $5.36 billion a hull — both in 2010 dollars. The Navy’s goal — set by the Office of the Secretary of Defense — is for $4.9 billion per boat. “When do we actually have to be at $4.9 billion? To be determined,” Johnson told reporters following the presentation. With the specifications locked in, the Navy will now work with lead ship designer — General Dynamic Electric Boat — to squeeze every dollar it can out of the design to hit the cost target set by OSD. Under the terms of the latest START treaty, the SSBN force will carry about 70 percent of the U.S. strategic nuclear warheads, placing a greater emphasis on the Navy for the strategic nuclear mission over the Air Force’s nuclear bombers and intercontinental ballistic missile (ICBM) forces. “It’s not whether or not we’re going to build the strategic deterrent. We’re going to do that. We have to,” said Rear Adm. Joseph Tafalo, the service’s head of submarine warfare (N97) said at the same panel. Tafalo pointed to the reduction from a SSBN force of 41 from its first five classes of 1960s and 1970s era boomers, to the 14 SSBNs of the Ohio-class and the 12 planned ORP SSBNs. Despite the historic reduction in the number of boats for the strategic mission, the $100 billion program will be among the most expensive shipbuilding undertakings in the Navy’s history. Tafalo’s N97 predecessor, Rear Adm. Richard Breckenridge, told Congress the Navy would need almost $60 billion dollars in funding — from outside the Navy’s budget — over the course of 15 years to prevent an impact to the Navy’s other shipbuilding accounts. The Navy plans to start construction of the first ORP in 2021 with a first planned patrol to start in 2031. The service included $1.2 billion in research and development funding for ORP as part of its Fiscal Year (FY) 2015 budget, released earlier this year. The ship design effort will borrow extensively from developments in the Virginia-class submarine attack boats (SSN-774) and the Seawolf-class (SSN-21) programs, service officials said. Some of the innovations planned for the new hull include an entirely new electric propulsion system and a life-of-boat nuclear reactor that will significantly reduce the time the boomers will spend in maintenance.